The contacts app that ships with iOS is a pretty straightforward affair that doesn’t offer much more than the handwritten address books we used to keep next to our landline phones. Humin is a new app that will be launching in beta this week that aims to be a smarter way for iPhone users to manage their contacts. Humin’s name doesn’t echo the word ‘human’ for nothing – co-founder and CEO Ankur Jain wants his startup’s product to understand relationships the way that you do. We don’t think of our network of contacts as an alphabetical list of names, our brains organise our contacts in more complex ways, but ways that make sense to us – where we met people, where they work, what they look like, who they know, and the like. 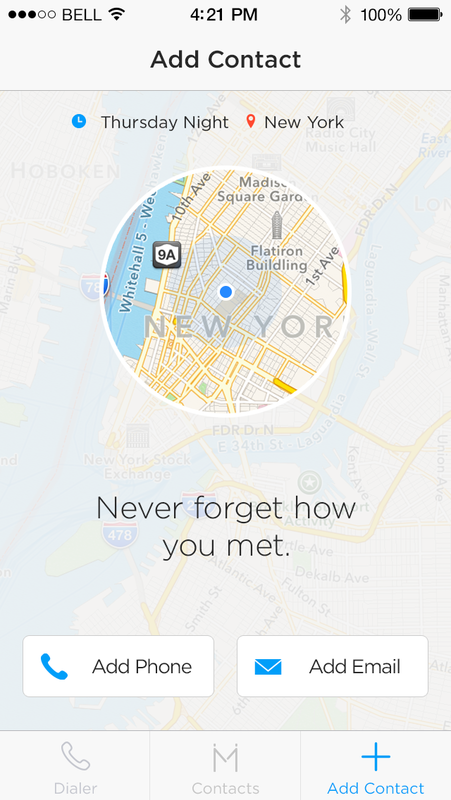 Humin wants to tap into that subconscious human logic without you having to do anything differently. The app has a slick onboarding process during which you can connect your contacts, calendar, and Facebook, Gmail, LinkedIn and Exchange server accounts. After a short wait while it builds your connection graph, you can dive in. The main screen offers ‘Recent and Suggested’ contacts and a search box to let you find anyone you may want to get in touch with. The search box lets you search in the same way you might rack your brain for a particular person. “Works as journalist,” “lives in Amsterdam,” “studied at NYU” and “met last week” are among the types of searches you can perform to find the person or people you’re looking for in your network, whether you’re connected to them via your email address book, LinkedIn or Facebook. 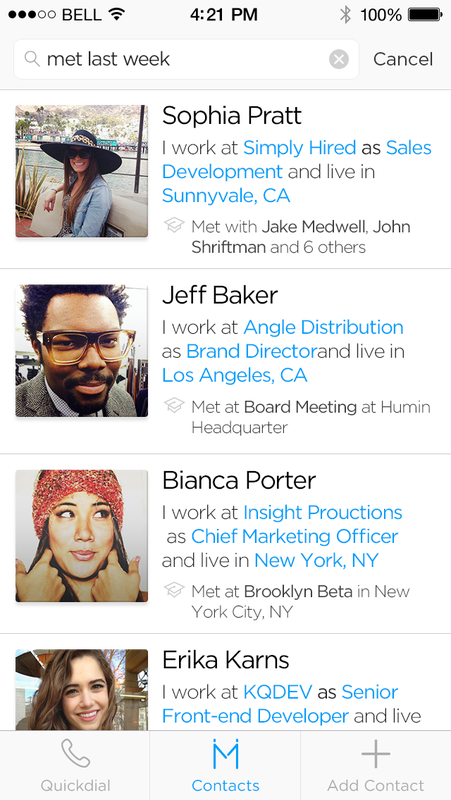 Tap a contact, and you’ll get a nicely presented overview of the data Humin has about that person, pulled together from your various connected accounts, along with details of the other people you know who also know him or her. If you add a contact via the app, time and location data of where you added them will be collected (on the assumption that you’re adding the person upon meeting them for the first time), to help Humin’s searches in the future. In addition, Humin has the usual ‘favorites’ function in the form or the Quickdial screen that boasts a neat ‘swipe right to call, swipe left to email’ function. 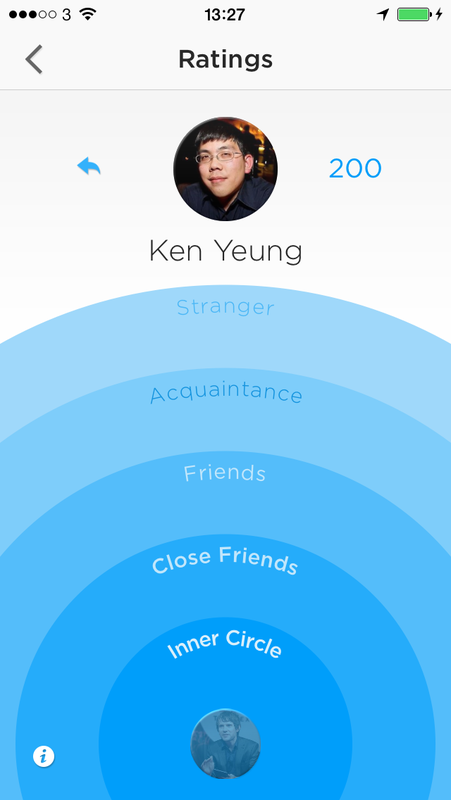 There’s also a dartboard icon in the top-right of the main screen that allows you to quickly rate contacts as a ‘stranger’, ‘acquaintance’, ‘friend’, ‘close friend’ or part of your ‘inner circle’, to help with Humin’s suggestions in the future. 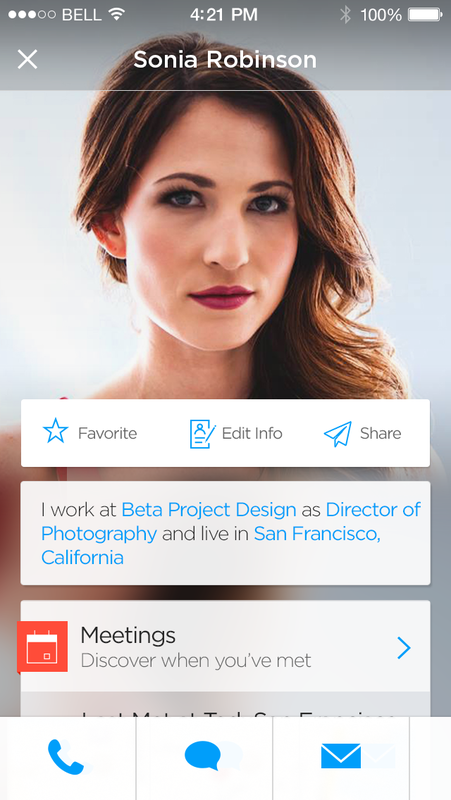 At present, Humin is a beta product – it looks gorgeous but it’s not quite as smart as it could be. Using the natural language of ‘works as a journalist’ in a search won’t work, for example – you have to type in ‘works as journalist’. 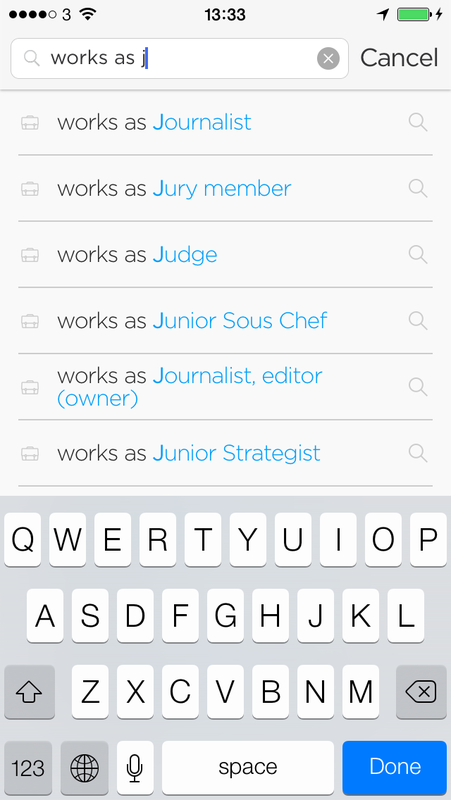 Even then, the app doesn’t know that people with job titles like ‘Journalist / Researcher’ or ‘journalist/blogger/editor’ are the same thing, let alone that you might be searching for anyone who works in any journalistic function, such as an editor or a subeditor, too. Still, it’s early days and Humin is being deliberately cautious in its rollout to ensure that it gets high-quality feedback from a small pool of invited users. You will be able to apply to test the app from midnight PST on Tuesday, January 21. It’s optimized for US use at first, although rollouts are planned for the UK, Netherlands, China, Germany and India during 2014. 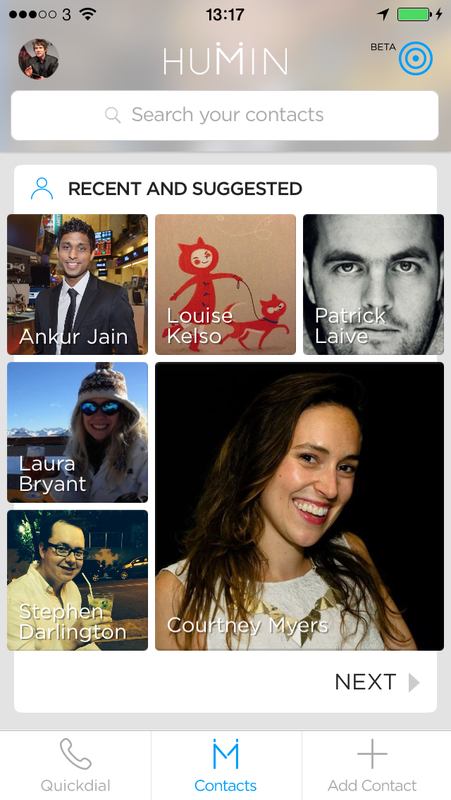 Humin is definitely a startup to watch this year. Its team includes people with backgrounds at Bell Labs, Warby Parker and the Kairos Society, and Mark Zuckerberg’s sister Arielle has joined the company as Senior Product Manager from her previous role as a product manager at Google-owned Wildfire. What’s more, Ankur Jain is the son of Naveen Jain – a director of the Singularity University and a man with whom I had one of my most interesting conversations last year (it’s not often you’re discussing the future of humanity in depth with a stranger within two minutes of meeting them) and who plans to set up mining operations on the moon. Even over a Skype video call last week, I could tell there was a similar flame of boundless ambition and enthusiasm for the world’s big problems in Jain junior so we’ll be watching Humin’s progress closely. One thing’s for sure, he tells me that he doesn’t want to sell the company quickly, so we probably shouldn’t expect to see an acqui-hire by Google or Yahoo in a few months’ time.